The Catholic University of America's accounting program is designed to prepare students for a career in the public accounting profession, private industry, government, and the nonprofit sector. This program also provides the basis for attaining the CPA (Certified Public Accountant) credential which is recognized nationally and globally. What sets this accounting program apart is the emphasis placed on learning and gaining real world experience from the accounting faculty who guide students in their accounting career. All faculty are CPAs and have considerable work experience in the private or public sector. Students majoring in accounting will complete the degree requirements for the Bachelor of Science (B.S.) in Accounting. Major Requirements: To earn a Bachelor of Science in Accounting, students must complete 23 business and economics courses. This includes: 11 core courses (introductory and managerial accounting, economics, management, business law, and ethics courses); 6 accounting concentration courses; 4 Math/Computer Science/Statistics courses; and 3 accounting electives. Students who have not achieved the above will not be able to enter or continue in the Accounting Program and will be assisted by their faculty mentor to identify another plan of studies or major within the School of Business. University Requirements: To earn a Bachelor of Science (B.S. ), students must also complete the core university requirements, specific to their major. Accounting students are required to complete 17 courses in addition to their business and economics courses. These courses include: philosophy, theology, humanities, literature, writing and composition, and three free electives. Study Abroad: Students majoring in accounting are encouraged to broaden their educational experience by spending a semester studying abroad in a country where English is not the native language and living with a family instead of in a dorm. Employers see a semester abroad in as an indication of the student’s ability to adapt to and deal with cultural, linguistic, and social change. The key to studying abroad while pursuing a Bachelor of Science in Accounting is to plan ahead. Schedule a meeting with your faculty mentor, and also visit the CUAbroad office. Internships: Some 80% of Accounting major graduates go to work for a global, national, or regional CPA firm. They offer tremendous career and learning opportunities with high starting salaries in the range of $55,000 to $60,000. Such firms typically start their recruiting of Accounting majors in their sophomore or junior year, through two day “Externships” and eight week “Internships”. If a student performs well during the summer internship they can expect to be offered a full time position upon graduation and completion of 150 credits. Minor Programs: Students majoring in accounting have a wide variety of minors available to them and may choose from many disciplines offered across the University. Popular choices for accounting majors are: foreign languages, politics, or philosophy. However, students majoring in accounting may not minor in a business discipline. While today’s job market for accounting majors is “hot”, it is also very competitive. Starting with Freshman year, organizations look for the following attributes: a high cumulative GPA, internship / work experience (especially in a finance or accounting area), demonstrated leadership experience, professional or internship experience, and multi-tasking abilities. 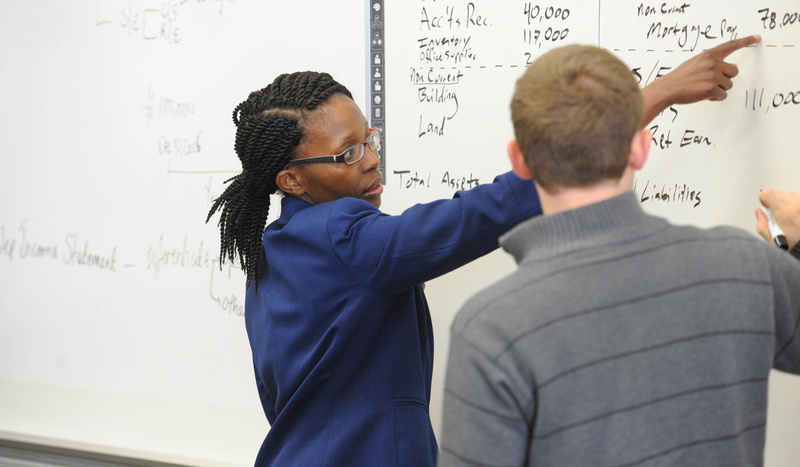 For accounting majors, career planning begins in a student's freshman year. It is the prime responsibility of the Accounting professors to educate and assist Accounting students in finding professional opportunities during their entire time at CUA. Such professors have considerable real world experience, strong business relationships, and a firm understanding of how organizations recruit. Popular career paths for recent graduates with an accounting major include positions with CPA firms in audit or tax, and consulting fields or in the commercial not for profit or governmental sector as a financial analyst, cost accountant, management accountant or business advisor. Organizations: For Accounting majors or students exploring the idea of changing to the Accounting major, the CUA Accounting Society offers an unparalleled opportunity to learn about career opportunities with CPA firms and how to achieve them. Each month’s event typically has a speaker from a CPA firm who is involved in recruiting students. They offer key insights and suggestions on a wide range of topics including: resume preparation, interviewing skills and techniques, as well as specific career opportunities with their firm.